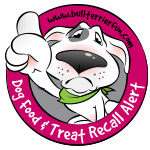 All of the dog chew products included in the voluntary recall identify an expiration date ranging from 06/01/2019 through 05/31/2020 located on the back of the package. The product was distributed in: The affected product was distributed nationwide from United Pet Group’s Edwardsville, Illinois, distribution facility and was delivered to consumers through various retail establishments including online outlets. This entry was posted in Look!, Recall alerts on dog food, treats and toys and tagged dog food recall, dog treat recall, Recall alert. Bookmark the permalink.